LOS ANGELES – 19 July 2018 – Today, the Generic Names Supporting Organization (GNSO) Council initiated the Expedited Policy Development Process (EPDP) on the Temporary Specification for gTLD Registration Data. Read the GNSO Chair Heather Forrest's blog for more details. Unlike other GNSO PDP efforts, which are open for anyone to join, the GNSO Council has decided to limit the membership composition of this EPDP. This decision is primarily based on the need to complete the work in a relatively short timeframe and to resource the effort responsibly. As such, GNSO Stakeholder Groups, the Governmental Advisory Committee (GAC), the Country Code Supporting Organization (ccNSO), the At-Large Advisory Committee (ALAC), the Security and Stability Advisory Committee (SSAC), and the Root Server System Advisory Committee (RSSAC) have each been invited to appoint up to a set number of members and alternates, as outlined in the EPDP Team Charter [PDF, 523 KB]. In addition, the ICANN Board and ICANN Org have been invited to assign a limited number of liaisons to this effort. However, that does not mean that members of the ICANN community cannot be involved if they are not appointed members, alternates or liaisons. One can follow the deliberations of the EPDP Team by signing up as a mailing list observer, follow the meetings via real-time audio cast, and check the recordings and transcripts accessible to the public. Furthermore, the Charter dictates that the EPDP Team should make provisions as part of its work plan to provide regular updates to the ICANN community and others interested, for example, through newsletters and webinars. Moreover, the EPDP Team is required to reach out at an early stage to GNSO Stakeholder Groups and Constituencies as well as other ICANN Supporting Organizations and Advisory Committees to request input. Last but not least, everyone will be invited to comment on the EPDP Team Initial Report once it is published for public comment. Per the EPDP procedures, the EPDP Team is expected to carefully consider and analyze all input received through the public comment forum. Further details on how to get involved are included hereunder. The GNSO Council hope that the ICANN community will make use of these opportunities to closely follow the EPDP Team deliberations! One can become an observer of the EPDP Team mailing list on a read-only basis. Sign up here: https://goo.gl/forms/iZg5JWHOnERsoEMI2. The names of mailing list observers will also be published on the EPDP wiki space. Check the EPDP Team conference calls on the GNSO Master Calendar. All EPDP Team conference calls will be recorded and transcribed. Recordings, transcripts as well as any notes and action items will be made available on the GNSO Master Calendar. In addition, all EPDP related materials, including recordings, transcripts, background documents, and team output, can be found on the EPDP wiki space. 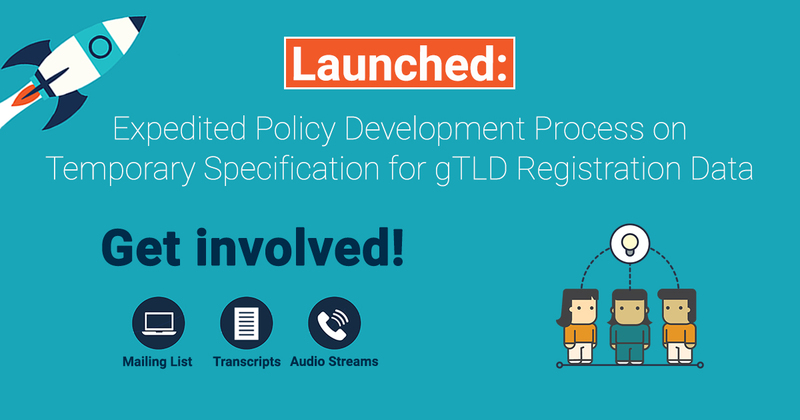 ICANN Org has gathered questions received on the EPDP and will continue adding questions to the live Frequently Asked Questions document as they are received. On 17 May 2018, the ICANN Board adopted the proposed Temporary Specification for gTLD Registration Data. This is an interim measure to bring existing WHOIS obligations in line with requirements of the European Union's General Data Protection Regulation. This also triggered the GNSO Council to undertake a policy development process to confirm, or not, the Temporary Specification as a Consensus Policy within 12 months of its implementation effective date (25 May 2018). The GNSO Council agreed that an EPDP provides the best opportunity to meet this timing requirement. To determine the proposed path forward, a Drafting Team was formed, consisting of Council leadership and interested Council members. The Drafting Team developed an Initiation Request [PDF, 390 KB] for an EPDP and a proposed EPDP Team Charter. During its meeting on Thursday, 19 July 2018, the GNSO Council passed the motion to initiate the EPDP and to adopt the EPDP Team Charter [PDF, 523 KB]. For further information, please email gnso-secs@icann.org.